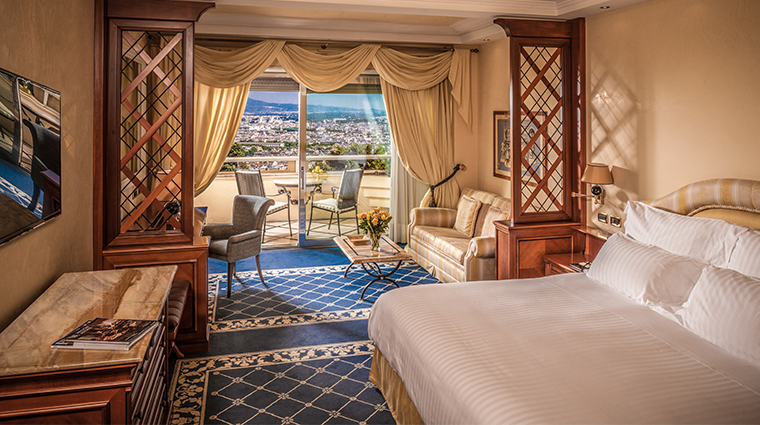 Rome Cavalieri, A Waldorf Astoria Resort best exemplifies the dual nature of the Eternal City’s personality — decadent dolce vita and a magnetic sense of history. 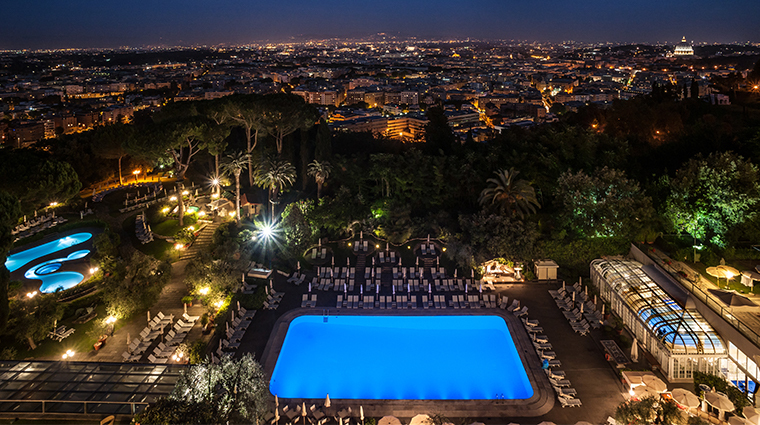 Its Monte Mario location literally sets it apart from the rest of the city, in a lush and green 15-acre park with panoramic views of Rome and Vatican City, making it a great luxury hideout. Service, sophistication and exclusivity are what you should expect at the Cavalieri. Staff is on hand at all times to anticipate every need, whether you request a nanny or nighttime helicopter tours. Classic elegance is the prevalent theme in each of its 345 rooms and 25 luxurious suites. La Pergola, helmed by chef Heinz Beck, delivers an eight-course menu that left even Michelle Obama asking for more. The former first lady was so enamored with the fagottelli (tiny square pasta parcels with cheese) carbonara that she asked for the recipe. The Grand Spa has decadence and design that harkens back to ancient Rome. The 26,000-square-foot spa complex includes four swimming pools (one indoors), Technogym equipment, tennis courts, a running trail and 10 uniquely themed treatment rooms (with La Prairie and St. Barth products). While the hillside location of this luxury hotel may be quiet and off the beaten path, creating a lovely sense of intimacy, it is only a 15-minute drive to downtown Rome, and even closer to some of the city’s most-talked-about attractions. 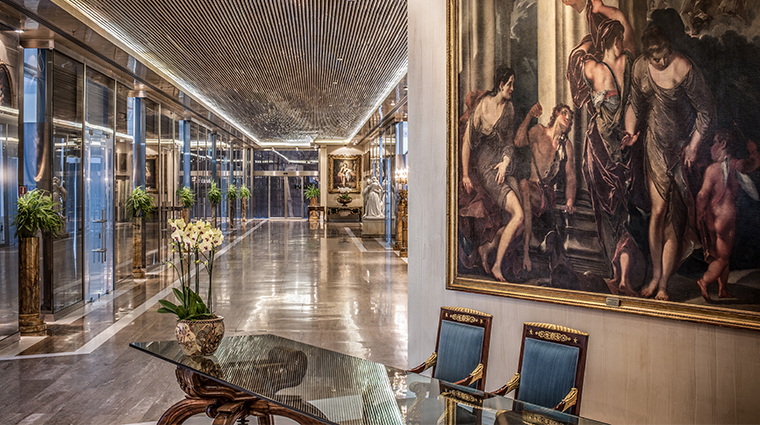 Each floor of the Cavalieri boasts amazing artwork from its spectacular private collection. Dating from the 17th to the 21st centuries, paintings, tapestries, statues and period furniture and costumes decorate the hotel’s walls. Check out three pieces by Giovanni Battista Tiepolo, Nureyev costumes and a rare 1725 Beauvais tapestry. For more than five decades, guests have hobnobbed with a range of royalty, from European crowns to silver-screen celebrities, at the Rome getaway spot. The spa’s beautiful Turkish bath has hot and cold plunge pools and the quiet zone — a Roman-style relaxation room where you lounge like an empress on velvet divans. 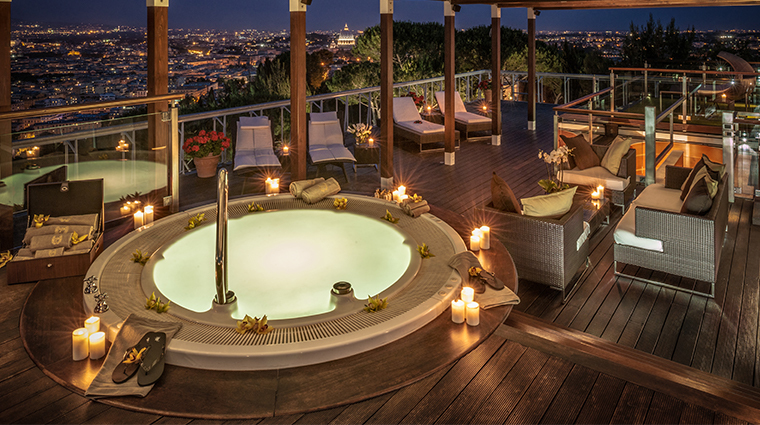 Nothing beats the Cavalieri’s view of the sun setting on the Eternal City. Spacious marble bathrooms, beautiful bed linens (with a 15-option pillow menu), antique furniture, lush sofas, Ferragamo toiletries and personal balconies are standard for deluxe rooms. If you stay on the seventh floor, you’ll have access to the Imperial Club, a chic private lounge and bar. Still, we’re most partial to the suites, in particular the bi-level Planetarium Suite with its mad mix of contemporary and classic art, fabulous Karl Lagerfeld sofas, and private rooftop garden and mini-pool. La Pergola is not only one of the top restaurants in the city, but its 9th-floor setting, provides one of the Eternal City’s most enviable views. Getting a reservation at the fine-dining establishment is about as difficult as getting a private audience with the pope — give yourself at least two and half months in advance and knowing someone high up can’t hurt. No matter what, always ask for a terrace table. Keep in mind that the restaurant is closed some in August and January. Sommelier Marco Reitano’s Italian wine list showcases some of the finest pours that the country has to offer. For a more relaxed vibe, the Pool Bar has an enticing hamburger menu. L’Uliveto serves one of the city’s best Sunday brunches.